Sto lat is the song/greeting with which Polish people are feted on their birthdays or name days (the latter being more important). 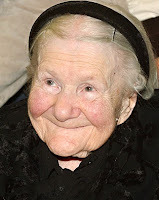 It means "may you live 100 years," and today would have been the 100th birthday of Irena Sendler, who was 98 when she died in 2008. Irena is a personal hero of mine; she was a social worker who smuggled Jewish children out of the Warsaw ghetto during WWII and worked with the underground organization Zegota until she was arrested in 1943 and tortured, but she managed to escape execution. She was recognized as a righteous person by Yad Vashem in 1965 and lived in relatively obscurity until she was "discovered" by Kansas students doing a history project. Sto lat, sto lat, niec zyje zyje nam. I love to hear stories like Irena's. Such character and courage! I've recently read "Testament to Courage," the journal of a German lady who hid Jews, and "The Things We Couldn't Say" about a Dutch underground worker, who is still alive and living here in Grand Rapids. Makes me wonder how courageous I would be to help others at the cost of my comfort or my life. Thanks, Marcia, for introducing me to Irena.